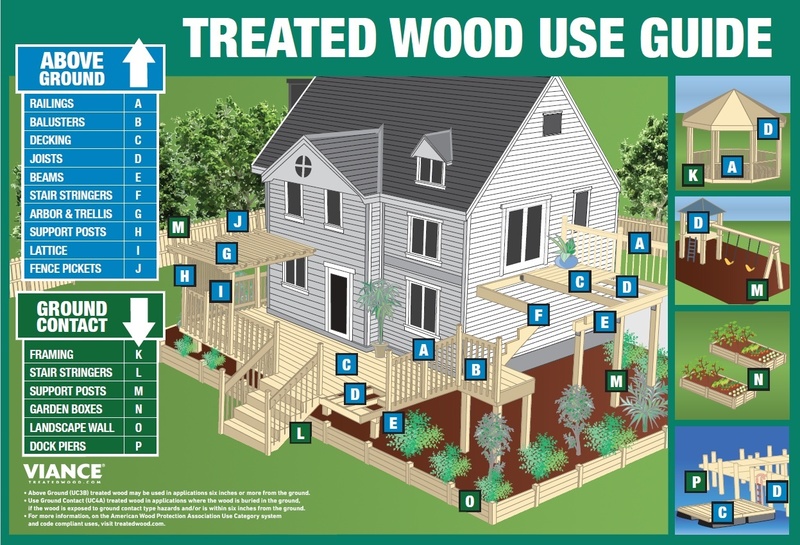 Above ground treated wood is code compliant for deck projects that are six inches or more from the ground. Above ground treated wood remains International Building Code (IBC®) and International Residential Code (IRC®) compliant for most deck projects under Section R317.1 and Section 2303.1.9 respectively. As code officials are inspecting deck projects, they should be guided by the latest, most accurate information available. Above Ground treated wood remains IBC and IRC code compliant for most common decking applications under Section R317.1 and Section 2303.1.9 respectively. To comply with the International Building Codes, pressure-treated wood bears the quality mark of an inspection agency that maintains the continuing supervision, testing and inspection over the quality of the treated wood. CheckMark and Inspection agency logo – if the treating plant subscribes to third-party quality control, you will see the logo of an agency accredited by the American Lumber Standard Committee and usually a “CheckMark” logo to make it easier to locate the agency logo. Manufacturer and Location – Name of treater and location of treating plant. lumber. The end tag should bear the distinctive CheckMark of Quality (pictured) as proof of ANSI-accredited, consensus-based AWPA standardization. The CheckMark of Quality assures code officials, builders, and consumers that the preservative has been reviewed by the AWPA to meet stringent standards for superior deck life, performance, and environmental safety. The AWPA standards are directly referenced in the IBC® and IRC® model building codes.